It’s that time of year again (although no doubt most of you have been there already) – looking back on 2013: what worked well, the successes, what didn't go so well and what and how things could be improved on for 2014. Also, of course, forward planning for our strategic, operational and individual objectives for 2014. Most organisations and businesses are certainly looking forward and planning at all levels with the key aim and purpose of building on the successes of the past 12 months (even leveraging off aspects that may have presented difficulties and challenges) and looking to improve aims, objectives, performance, results, etc, in innovative and challenging ways. Of course many of our MindGenius users are already benefiting from the unique plethora of functionality and productivity-enhancing applications that MindGenius offers, not least in the review and forward-planning areas. As we approach year-end and plan towards the start of a new year, I want to to share some insights and tips on the range of use and applications that MindGenius provides, particularly in providing clarity and focus on the critical processes of Review and Planning. PLAN: The Oxford Dictionaries definition of “Plan” is: “a detailed proposal for doing or achieving something”. 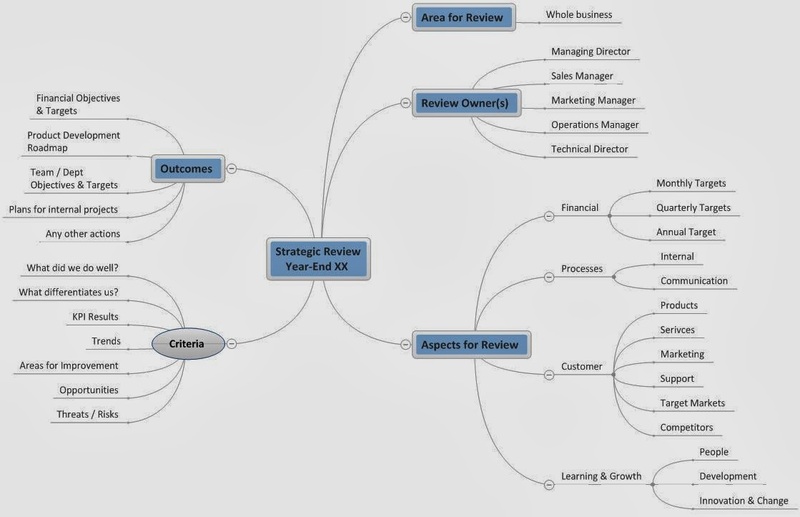 Below is an example map showing an outline of a process for reviewing past performance around key aspects and criteria and then, in addition, including the forward-planning aspects as well…. 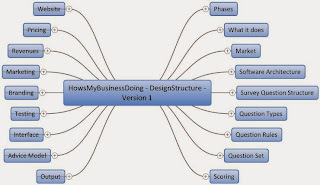 ease of mapping a structure or template for any type of Review or Plan (together or separately), including the quick and intuitive “type and return” functionality of capturing all the input, data, facts, knowledge, etc. Remember also, MindGenius Ltd provide an extensive range of tailored training and consultancy solutions for individuals and teams. If you need to gain a better understanding of how MindGenius can improve your current processes for Review and Planning, simply contact your Account Manager or email info@mindgenius.com and we can discuss your options. Finally I would just like to personally wish all Newsletter readers and MindGenius users all the very best as we end one year and look forward to a new one, we look forward to working and collaborating with you all in 2014. Niall Strickland has been using MindGenius for more than 15 years and it consistently forms part of his toolkit for helping medium and small companies to improve their business performance. Not content with successfully using MindGenius within his business to deliver value to his clients, Niall continues to push out the boundaries in relation to how he can create value from MindGenius. About 18 months ago, Niall effectively used MindGenius to design new and highly innovative expert system software, which can be used by businesses to carry out a detailed health check on their business. Niall says “MindGenius was not only the catalyst for capturing the core idea behind the software design, but was also the tool used for creating the functional and technical specifications for the software”. Instead of providing the software development team in Germany with long text documents, Niall instead provided it with structured MindMaps that captured the very essence of what he was trying to create. “This worked exceptionally well,” according to Niall. 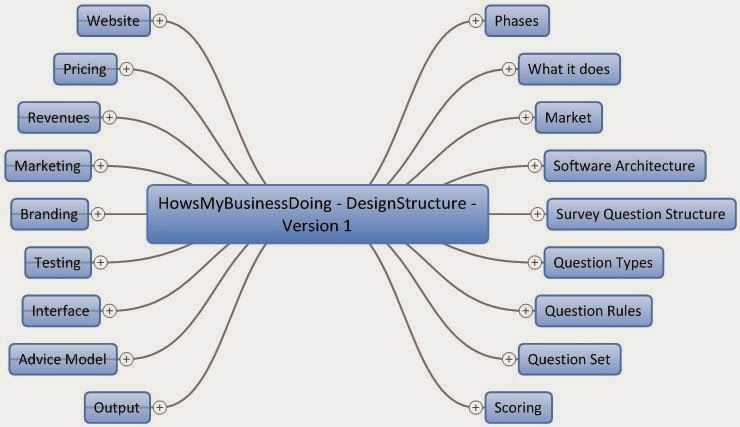 “It not only set out the business case for the software product, identified its target market and delivery channels, but also gave the development team all it needed in order to create this state of the art business software product.” A collapsed version of his initial software design MindMap is shown below. Niall believes that there are simply no limits to the application of MindGenius within both business and the education sector and he actively encourages his extended network to adopt it as the mind-mapping tool of choice. Niall has put together a video on how he and Tammy use MindGenius and "The Many Benefits of Using MindGenius MindMapping in Your Business." View the video here. “HowsMyBusinessDoing?”, does a detailed analysis of any business across 28 key measurement areas and automatically generates a 50+ page report which helps the business owners or managers to identify and focus on key areas of their business requiring attention. 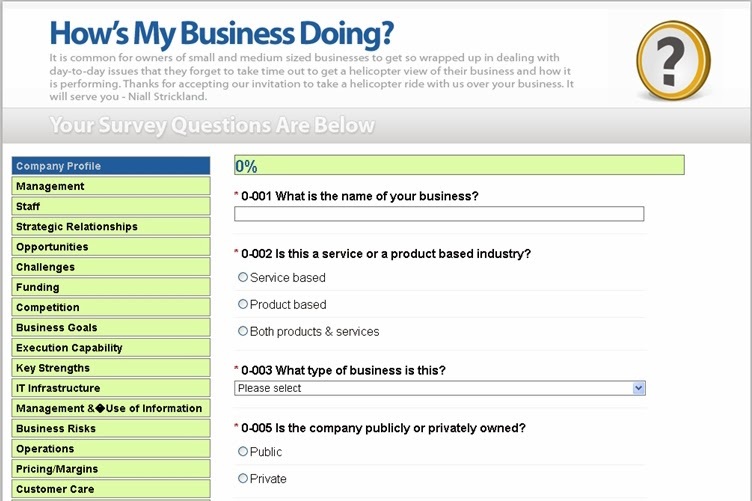 Business owners simply need to complete a confidential online survey about their business, which takes about 90 minutes, and the intelligent software engine automatically provides detailed feedback on what is working in the business and what is not. “HowsMyBusinessDoing effectively replaces the need to employ a management consultant to assess how your business is performing and all for less than $500,” according to Niall Strickland. "From a value standpoint, it is a tiny investment for a huge return." For more information on “How’sMyBusinessDoing?” click here, or here. Niall has also introduced MindGenius to his teenage daughter, Tammy, who has used it to generate tens of thousands of Euro from selling her MindMaps to secondary school students in Ireland.